I am the slave of that perfect Moon! Don't talk to me of suffering, I don't want to hear. and if you can't, keep silent! "I am here, why are you so worried and afraid?" O Love, I am overwhelmed with fear. just nod your head and don't say a word." Oh how delicate, how subtle is the path of love! This most precious Moon-like beauty appeared to me! My heart, is this the Moon or my imagination? don't you see, you have been blessed." But what is this, the face of an angel or a man? "Be silent, what you see is beyond angels or men." But what is it, tell me, or I will go out of my mind. O please, I begged, tell me, is this the face of God? sense it to the depth and say no more"
sense it but say no more"
move out but say no more"
but for God's sake say no more"
"Rumi -- Fountain of Fire"
say no word but Orb! There is no other thing, say nothing! Heart, what orb is this? Is this the face of man or angel? for doesn't this match God's description? 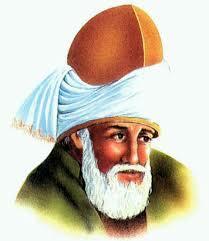 "Rumi -- Past and Present, East and West"
beloved, beside which all other thoughts and images pale.